The last week of November saw all four of the St Andrews table tennis teams return to league action. At Memorial Hall on Monday, Prefects faced Rockets in Division 2, with Swots seeking their first win of the season against Viscounts in Division 3. Prefects’ drama lasted until 10pm after six of their nine games took five sets to decide. Prefects led 4-2 and Kong Wan and Ian Smith were 2 sets to 1 ahead in the doubles against Carol McLean and Jim Hodson when Kong took a nasty tumble, banging his head against the wall. Unsettled, the St Andrews pair failed to recover from the incident and lost the game. After a rest, however, the wounded soldier showed terrific spirit to play on and win a tense final game in five sets against David Fletcher. Final score 5-5 (Ian and Kong two wins each; Ken Falconer one win). Swots finally picked up their first league victory of the season with a fighting display against Viscounts that saw all but one of their six wins coming in five sets. Emma Bisset was the star of the night with a terrific hat-trick of singles wins. Dave Beveridge, still deputising for big Dave Goddard, and Collin Bleak both chalked up fine wins against Eddie Dougan. Emma and Dave then combined forces effectively for the second time this season to win the doubles. Swots’ crucial sixth win came in game eight. Emma sprinted to a two set lead but Eddie came storming back to force the game into a marathon fifth set. After both players had squandered several match points Emma ultimately prevailed 20-18! On the same night New Kids travelled to newly promoted Kingsway and recorded yet another comprehensive victory in Division 2. 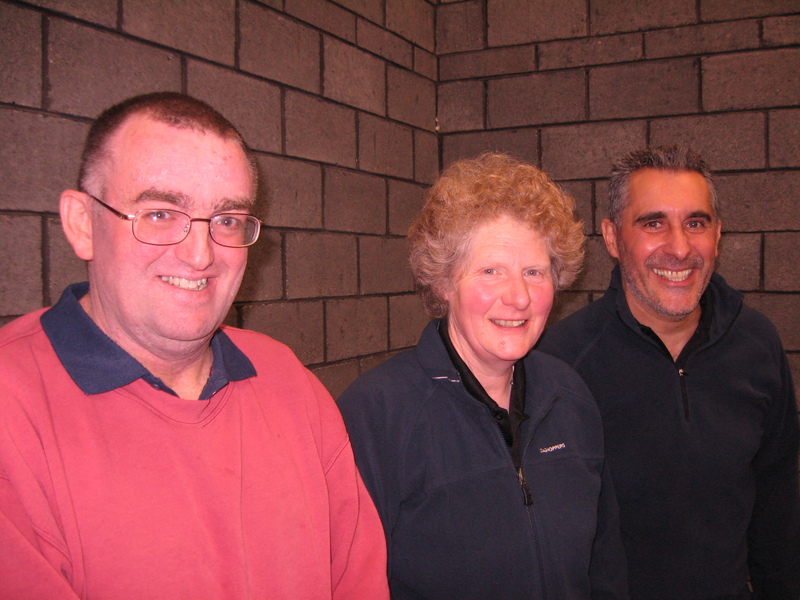 Peter Bladen (3 wins), Elaine Forbes (3) and Nick Shepherd (2) were the triumphant trio. Nick seemed to be heading for a win at 5-1 up in the fifth set against wily Willie Cooper but was caught at 10-10 and lost the last two points. Elaine and Nick won the doubles match to complete a 9-1 rout. 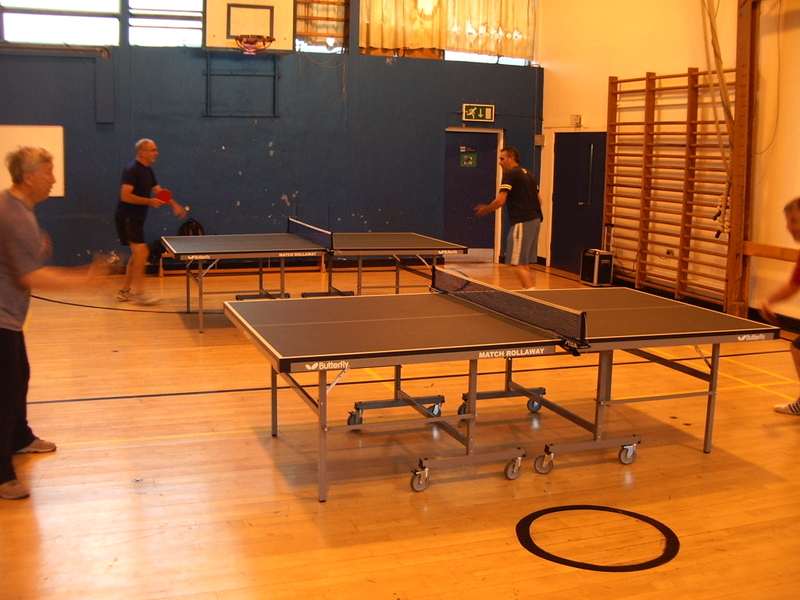 This entry was posted in Match reports, St Andrews Table Tennis Club and tagged New Kids, St Andrews, Table Tennis on November 30, 2013 by standrewstt. It was an exciting week of epic battles for teams from St Andrews Table Tennis Club. In the home matches, both the Prefects and Prospects came away with pleasing victories. The trio of Ian Smith, Ken Falconer and Howard Lee playing for the Prefects edged through to the semi-final of the Secondary Shield after seeing off Defenders by the narrowest of margins, 5-4. Details of this exciting encounter are in previous post (below). On the neighbouring tables, Prospects took on Lairds in a postponed Division 4 match. Prospects had won handsomely at their last meeting but they hadn’t previously met young Craig Shearer who proceeded to beat each of the St Andrews players in five sets. Dave Beveridge, Maxi Strobl and Vuksan Mijovic held their nerve though and were 4-3 ahead after Dave and Vuksan took the doubles game in five sets. Lairds leveled the match at 4-4 but, with young Craig now out of the picture, Vuksan and Dave made no mistakes to win the last two games and ensure a 6-4 triumph. On Tuesday, Prospects lined up again against the young Princes at Ward Road in Dundee with Freddi Beinke stepping into Monday’s line up in place of Maxi Strobl. The match had a similar look to Monday’s with Blair Duncan beating each of the Prospects and Dave, Maxi and Freddi all winning against Nathan Christie. Princes played with a man short and, with Dave and Freddi winning the doubles match in straight sets, Prospects left the hall with a welcome 7-3 margin. On Wednesday Swots and New Kids both travelled to Dundee College for cup action against Rollercoasters and Attackers. Big Dave called in sick for Swots, so wee Dave was called up to play for the third night in a row alongside the sleep-deprived Collin Bleak and Emma Bissett, who was nursing a cold. Surprisingly, it was only reserve Dave who could muster a fine five set win during business end of the match, although Emma thrashed Paul Jackson in straight sets after Swots has exited the Consolation Cup for this year. Final score 1-5 (2-7). There was no drama for New Kids who turned in their now customary performance to join Prefects in the semi-final of the Secondary Shield. Pete Bladen, Elaine Forbes and Nick Shepherd beat the Attackers 5-1 and must now be odds-on to achieve a remarkable league and cup double this season. The all-conquering New Kids trio of Peter Bladen, Elaine Forbes and Nick Shepherd. 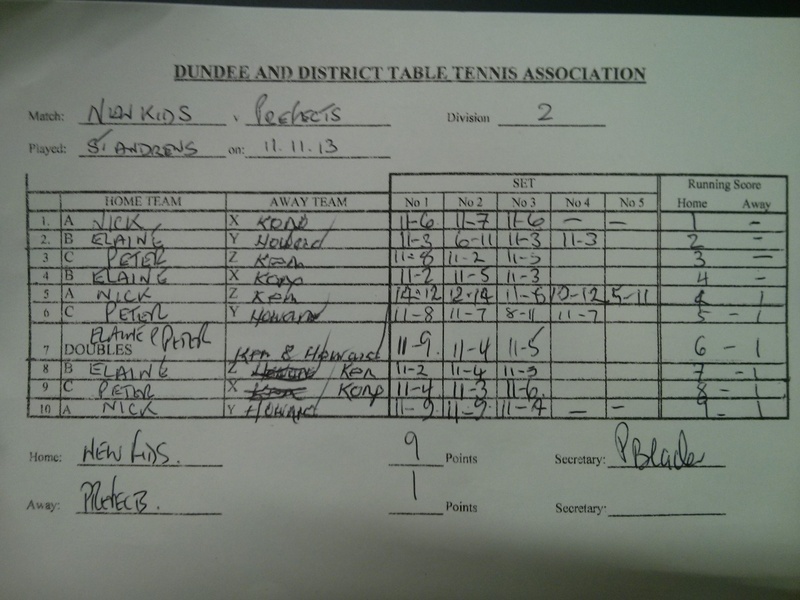 This entry was posted in Match reports, St Andrews Table Tennis Club and tagged Dundee College, Elaine Forbes, Ian Smith, Ken Falconer, Maxi Strobl, New Kids, Nick Shepherd, Peter Bladen, St Andrews, Table Tennis on November 22, 2013 by standrewstt. Prefects welcomed Defenders from Dundee College in the third round of the Secondary Shield. Howard Lee, Ken Falconer and Ian Smith lined up for the Prefects against strong opponents in the form of Ken Head, Scott Thomson and Richard Tough, recently relegated from Division 1. Attacking relentlessly, the Defenders won the first two games. Ian Smith pulled one back with his first ever win over Ken Head. Howard then overcame Richard in an epic 5 set thriller, 12-10 in the fifth. But the Defenders soon re-established their lead in the match 4-2. The Prefects didn’t give up as Howard did the business again with another 5 set victory over Ken Head and Ian beat Richard to draw the match level at 4-4. The final encounter witnessed Ken Falconer, who hadn’t yet won a set all evening, take on Scott Thomson who hadn’t dropped a set all night. Ken dug deep, really deep, to take Scott into a deciding fifth set. Scott played with all guns blazing and Ken struggled against Scott’s top spins and smashes as he fell behind 2-7. But Ken refused to be defeated. He found his best form and played with great consistency as he steadily caught up, closing the gap to 7-9. By now Ken had the momentum and found himself with a match point at 11-10. Scott recovered briefly but Ken made no mistake as he carefully aimed his shot to clip the edge of the end of the table. Scott could do nothing as Ken completed his amazing comeback to clinch the set and match for the Prefects 13-11 and to send them through to the semi-final. 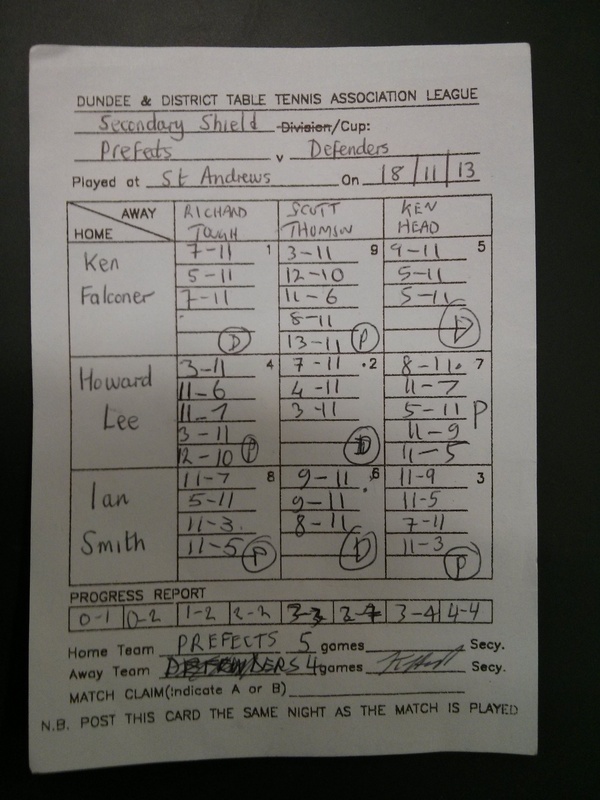 This entry was posted in Match reports, St Andrews Table Tennis Club and tagged Dundee College, Ian Smith, Ken Falconer, St Andrews, Table Tennis on November 19, 2013 by standrewstt. Week 7 of the Dundee and District table tennis league saw three teams from St Andrews in action, but they played in only two matches. It won’t take the club’s mathematicians to work out that it was derby week, with New Kids and Prefects colliding in division two for the first time this season. The big match simply served to reinforce the dominance of the Kids this season when they ran out comfortable 9-1 winners. However, there were some brave performances from Prefects. 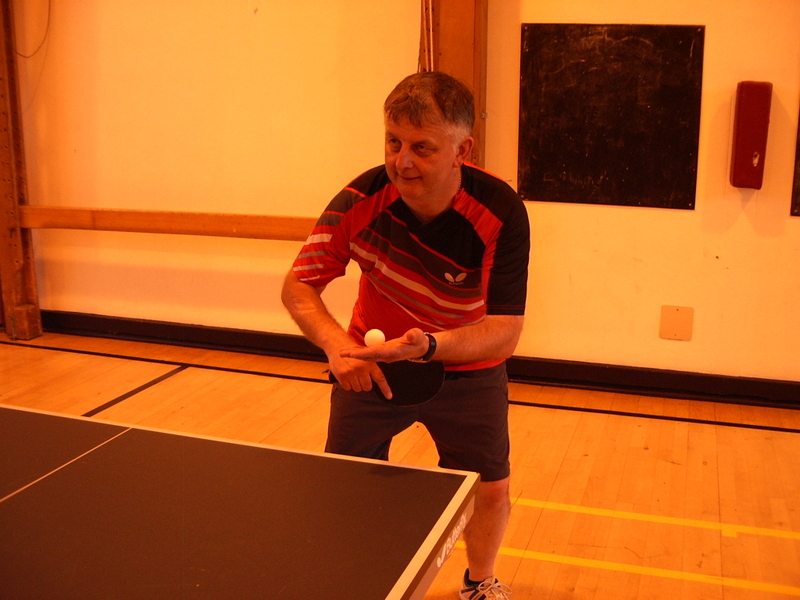 Howard Lee took a set off both Elaine Forbes and Pete Bladen and Ken Falconer chopped his way to a fine five set win over Nick Shepherd – but that was as good as it got for Prefects. Apart from the set lost to Howard, Elaine lost no more than 6 points in any of her other sets. Elaine and Peter completed another personal 100% performance when they won the doubles game in straight sets against Ken and Howard. On Tuesday, Swots travelled to Dundee to meet Tass, with Dave Goddard and Emma Bissett calling Freddi Bienke onto the team bus in place of Doctor Bleak, who has been doing some sums in Canada. Regrettably their torrid season continues without a win and they remain in the bottom half of division three after being felled 7-3. The Swots each managed to beat Brian Hamill but lost to anyone called Stuart, Stewart, or Stuart and Stewart. Prospects’ home match against Lairds was postponed to the following week. They now face several crucial, but winnable, matches in quick succession that will likely make or break their challenge for promotion from division four. 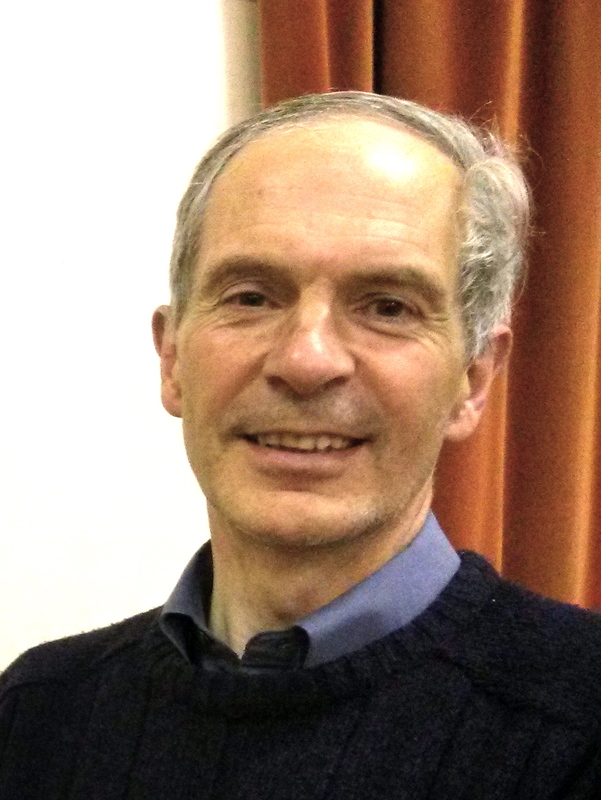 This entry was posted in Match reports, St Andrews Table Tennis Club and tagged Ken Falconer, New Kids, Nick Shepherd, St Andrews, Table Tennis on November 13, 2013 by standrewstt. St Andrews Table Tennis Club opened its doors this week to welcome students from St Andrews University Table Tennis Club for a friendly practice night. 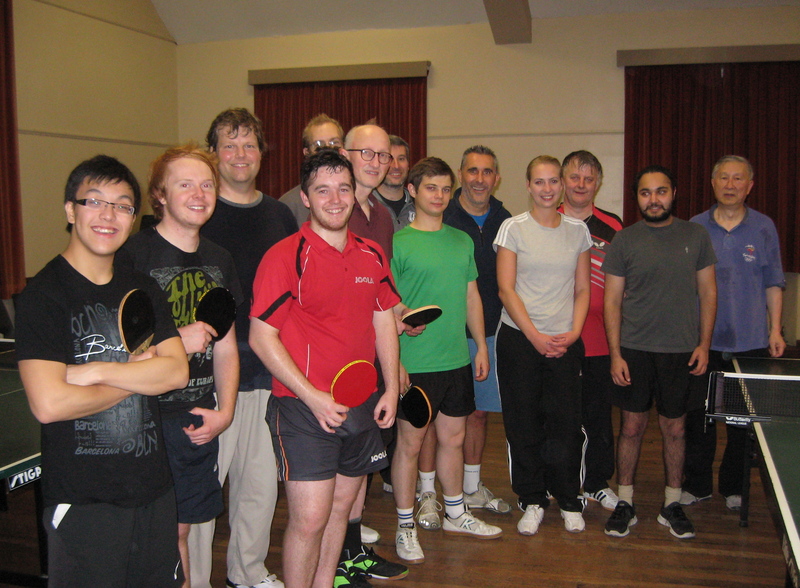 Everyone enjoyed meeting some new opponents and sharing in table tennis fellowship. 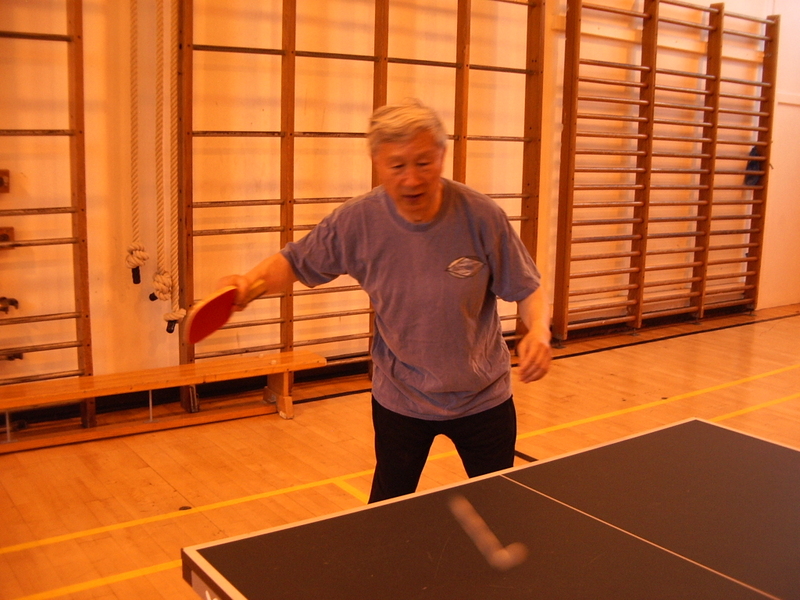 This entry was posted in St Andrews Table Tennis Club and tagged St Andrews, Table Tennis, Victory Memorial Hall on October 29, 2013 by standrewstt. This entry was posted in St Andrews Table Tennis Club and tagged Madras College, St Andrews, Table Tennis on August 17, 2013 by standrewstt.